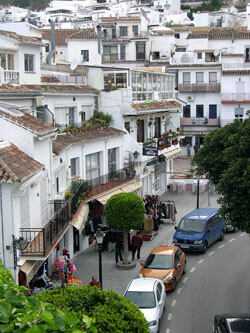 Mijas is situated 31 km west of Malaga and about 8 km from the seashore (428m above sea level). It is a beautiful white Andalusian village in Arabian style with marvelous views and terraces. If you want to enjoy nature, you have splendid excursions into the natural park of "Sierra de las Nieves". Either you can walk or enjoy a ride with the famous "Burro-Taxis" (Donkey Taxis). During this pleasant ride you can discover the most outstanding monuments of the village, for example the Sanctuary of "La Virgen de la Peña" from the 16th century, excavated out of the rocks. The infrastructure of the village counts as well with several several museums and a municipal auditorium.